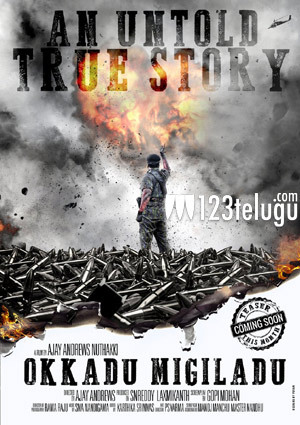 It is well-known that Manchu Manoj will be seen as LTTE Chief Velupillai Prabhakaran in his upcoming action drama, Okkadu Migiladu. The film’s post-production formalities are going on in full swing. This morning, Manoj kick-started the film’s promotions by tweeting a striking new poster. The poster reveals that the film’s teaser will be unveiled later this month. Manoj is essaying dual roles in this movie. Anisha Ambrose is the film’s leading lady and debutant Ajay Andrews Nuthakki is directing this movie. SN Reddy and Lakshmikanth are jointly producing it.